The NoiseMaker plugin will allow you to accurately create 3D noise with a wide variety of parametric generators. Take the surface detail of your models further with camouflage, scales, hex tiles and more inside this powerful enhancement. Use NoiseMaker to affect sculptural changes too. When using NoiseMaker in conjunction with features like masking and alphas, the possibilities are endless. Load images to be applied as alphas inside the surface noise maker preview window. Gain an unparalleled level of refinement, and generate surface texture in a fraction of the time. Moving around inside the NoiseMaker window is simple. 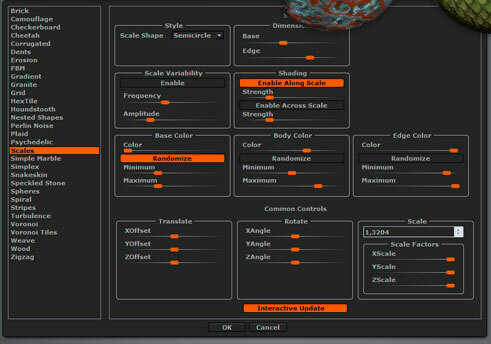 NoiseMaker features ZBrush navigation, a larger preview window and new masking capabilities to provide multiple scaling options for your noise. This means you can dynamically create ranges in size and directionality, with respect to how your noise is applied to your models. By using interpolated masking per polygon for an accurate display of noise even on lower polygon meshes, the NoiseMaker plugin is sure to meet your creative demands at each level of the design process. 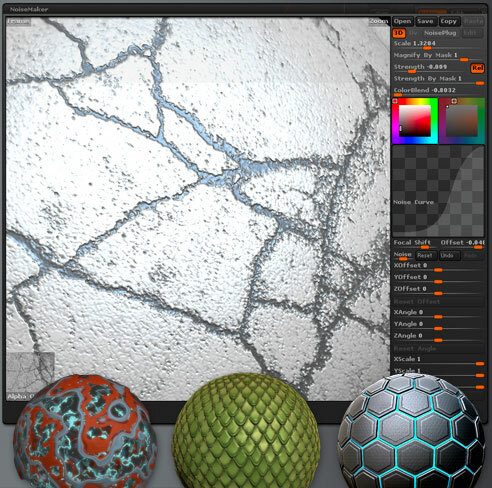 With the ability to export fibers as vector displacement maps, you’ll be taking advantage of proprietary technology only available inside ZBrush. It’s all a part of the drive to create the strongest artistic toolset available.